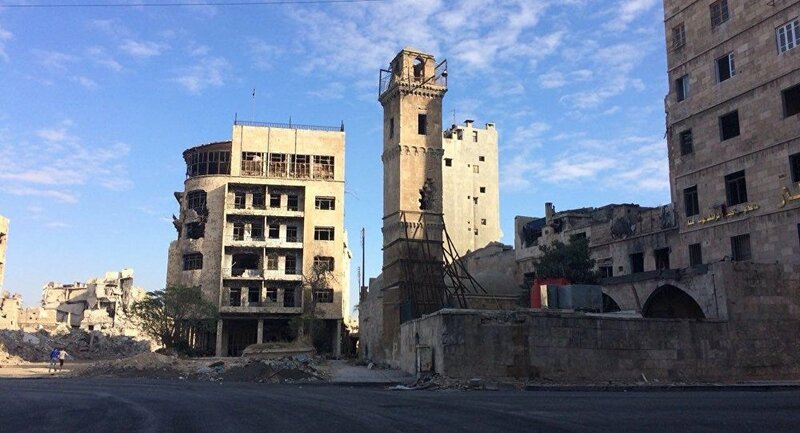 BEIRUT (Sputnik) - One woman was killed and six people were injured, as a residential district in the Syrian city of Aleppo was shelled by militants, the head of the hospital at the state university, Ibrahim Hadid, told Sputnik on Sunday. "The shells exploded in 3,000 Shaqa neighborhood. As a result of one such explosion, a woman and her five kids were injured. Another shell killed a different woman. All of them were treated in our hospital. There are some serious wounds," Hadid said. The militants launched a total of six or seven shells. A five-month baby is in the most serious condition because of the wounds sustained in the shelling. On Friday, three neighborhoods were shelled in the city, one person died and two were wounded. Earlier, commander of the Russian reconciliation center for Syria Maj. Gen. Yuri Yevtushenko reported that at least two people had been killed and nine others injured in a shelling attack on Damascus' residential area. He also said that despite the ceasefire regime being established throughout Syria, the Russian-Turkish-Iranian Coordination Centre had registered several cases of ceasefire violation in the provinces of Aleppo, Latakia, Damascus, and Daraa.